So this weekend I am off to party with 80,000 other music fans. No big deal. If you’ve been following this blog for a while, you know that I never go anywhere unprepared, and my healthy tummy, no matter where I am, always comes first. Although I’ve heard that there will be fruit stands and lemonade carts set up at this festival, I can’t take any risks – I must bring reinforcements! I’ve been pondering the kind of snack that travels well, doesn’t need refrigeration, and is calorie-packed for a quick hit when the never-ending nights of dancing never end. I’ve come up with a raw food snack that fits the bill, and is both tasty and uber-healthy. The great thing about raw foods is that they contain far more nutrition than their cooked counterparts. Raw foods also contain enzymes, the substances necessary to digest and absorb the nutrients inside them. When we don’t eat raw foods, our bodies must work hard to produce our own digestive enzymes, and after years of doing so, our ability to digest properly declines. 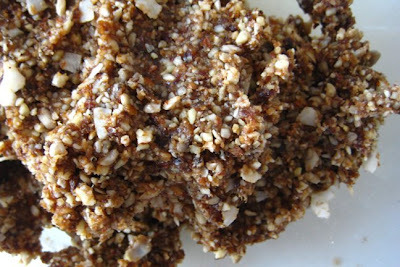 You can read more about the benefits of raw foods from my previous post, here..
You probably eat a lot of raw foods already: fruits, salads, smoothies – but here is a recipe for a raw food snack that will hopefully inspire you to include more raw foods in your diet – it’s easy! The base for this snack comes from dates. I am a huge fan of these delicious, dried fruits because they taste just like brown sugar, but with tons of health benefits! They are power-packed energy nuggets, filled with nourishing carbohydrates, fiber and naturally occurring sugars, which are quickly assimilated in the body. They are also an excellent source of potassium. Potassium is an essential mineral your body needs to maintain muscle contractions including the vital heart muscle. Potassium is needed to maintain a healthy nervous system and to balance the body’s metabolism as well. In addition, dates are an excellent source of B-complex vitamins for energy, and magnesium to metabolize that energy. So perfect for the amounts of energy I require when I am sacrificing sleep for dancing! These snacks also contain nuts and seeds, which are excellent sources of healthy fats to satisfy hunger in a hurry, and vegetarian protein for non-meat eaters like me. You can mix and match the nuts and seeds to suit your dietary, nutritional, and flavour preferences. Just make sure you maintain the nut-to-fruit ratio for proper consistency. 2. Place the dates and /or other dried fruits in a food processor. Pulse until processed to a paste. Transfer paste to a medium bowl (don’t clean processor). 4. Taking small amounts at a time, shape the kneaded fruit dough into small balls. You can roll the balls in sesame seeds, which will prevent the balls from sticking together, but this is optional. I like the crunch it gives and the extra boost of calcium never hurts! 5. Store in layers, in parchment-lined containers in the refrigerator until you set off on your next energy-intense adventure! Hopefully, I wont be stuck eating falafels and other “fake health food” all week, but who knows? Sometimes, you just have to embrace the full experience and make sure you’ve got a little bit of energy tucked into your back pocket. You never know when it will come in handy! Hi Sarah, Thanks for sharing this recipe! I will make this soon. I just made some music lover orbs, but with a tweak: I`ve rolled them in cocoa, because they were a bit to sweet for my taste, now they are little energy bombs. Thanks for the recipe Sarah! These look so good! I’m not crazy about sesame seeds so I may try rolling them in toasted quinoa. This cake is absolutely delicious & so easy! I’ve already made 3 different ones this week. Blueberry is my favorite. You can use almost any fruit. I just made it with mango last night, so refreshing. 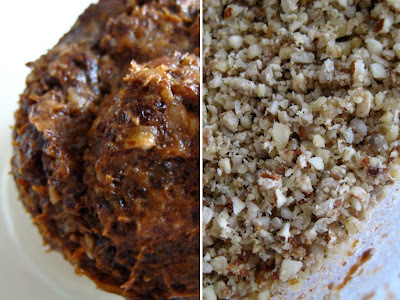 did you use soaked nuts or un-soaked for this recipe? So happy to hear that you and your daughter are groovin’ on the orbs! Have a great trip! sarah…just made these last night and i think they will be my savior on our flight to paris this week with my two year old. she loves them and im hoping to keep feeding them to her to keep her content. thanks! SO, I made these, and they are awesome. and were so lickedy split fast to make. I’m very excited to try them on my friends at the music fest this weekend! sarah! Does this recipe call for semi dried dates or the dried DRIED ones? Ive always eaten (and LOVED) the ones that are about the size and dryness of dried apricots, but when I went to buy some this week I found ones that are… somewhere in between dried and fresh? thanks girl! So excited to try this. where i was living in australia you could buy these things called “byron bay bliss balls” which i think are very similar. yay!! What a fabulous blog. I tripped on it as I was researching “yujai breathing” … and your posts on yoga. I’ve gladly forwarded your blog to many veggie-eating pals. Can’t wait to try some of these yummy recipes. You must work hard on each post (photos are great too). Just wanted you to know you are appreciated!